Welcome to Ruckinge & Hamstreet Scouts & Guides. The Group is a rural Group based in the village of Ruckinge on the edge of Romney Marsh in Kent. This is a very active Group with currently over 120 members from all sections of both movements. All the facilities are owned by the Group and shared by all sections. The Headquarters building is situated in the centre of the village, (OS TR025337- postcode TN26 2NY) on the edge of farmland, and only a short walking distance from woodland and the Royal Military Canal (suitable for canoeing). Ample parking is available. The town of Ashford is just seven miles away with easy access to the M20 motorway (junction 10) to London and the coast. 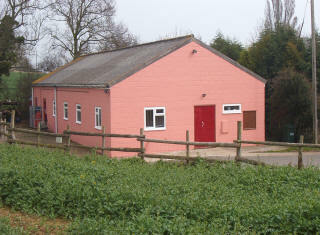 The HQ was built in 1989 by volunteers from the parents and supporters. The building consists of a hall 50ft x 30ft, both ladies and gents toilets and a large fully equipped kitchen. For a view of the floor plan, click here. The hall is available to let for members of either movement for long or short stays, particularly during school holidays and can be used for overnight stops on the way to the continent. To obtain further information, please e-mail rhscouts@btopenworld.com. For directions to the HQ, please click here.